NASA's on a mission to uncover the secrets of the Moon's formation, and they'll have to journey to its core to do it. But there wont be any drilling on this expedition. Instead, the agency will employ two identical, orbiting spacecraft — dubbed GRAIL-A and GRAIL-B — to take precise measurements of the Moon's gravitational field, providing NASA scientists with data that will reveal the craggy body's internal structure in unprecedented detail. 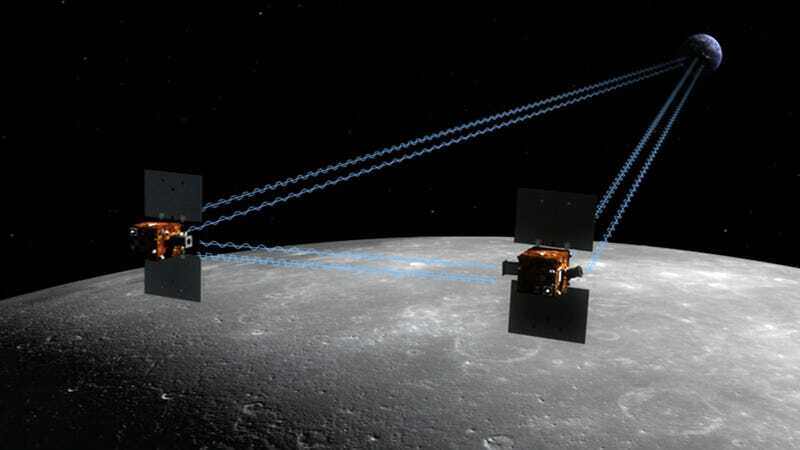 The twin GRAIL probes (GRAIL = Gravity Recovery and Interior Laboratory), which were launched back in September, are scheduled to enter the Moon's orbit this weekend in sequence, with GRAIL-A arriving on December 31st, and GRAIL-B on January 1st. The spacecraft will then spend the next two months spiraling down to orbits just 34 miles above the lunar surface, at which point they will begin collecting measurements. According to MIT's Maria Zuber, principle investigator for the GRAIL mission, the probes' readings stand to revolutionize our understanding of the Moon, and will "rewrite the textbook" on its evolution. "[The GRAIL mission] will improve our knowledge of the Moon's nearside gravity by more than 100 times over what was previously known, and by more than 1,000 times over what was known on the far-side," she explains. And as you might imagine, a 1000-fold increase in understanding translates to some pretty cool applications. Better understanding of lunar gravity will help us optimize future spacecraft landings, while the ability to reconstruct the Moon's early evolution will help us better understand the formation of numerous other large bodies in our solar system, including Earth. Most exciting of all, however, is this mission's potential to open doors to applications we haven't even considered yet. "In science, when we can improve measurements by a factor of two, we usually learn an awful lot," said Zuber. "But when we improve measurements by orders of magnitude, the kind of science that we do is actually transformative."